HMES Wins Prestigious FETC Award! 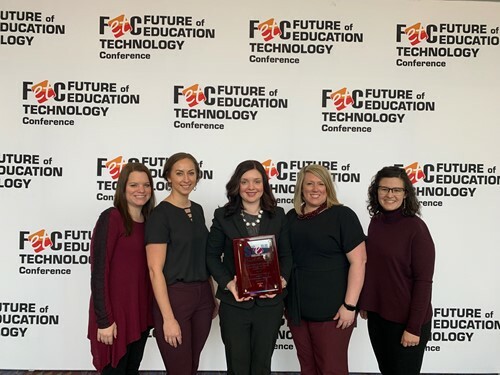 Herbert Mills STEM Elementary School, an Ohio Designated STEM elementary school, took home the top prize at the Future of Education Technology Conference (FETC). The FETC STEM Excellence Award recognizes excellence and innovation in the field of STEM learning at all three levels of school, with winners selected at each level. This national award evaluates applicants on the use of Interdisciplinary Curriculum, Collaboration, Design, Problem Solving and the STEM Experiences offered. "To be nationally recognized for excellence and innovation in the field of STEM education is an incredible accomplishment and we are so proud of the staff at Herbert Mills! It epitomizes the type of work that we do and the kinds of experiences that we work tirelessly every day to build for our kids in our district. Congratulations to Mrs. Weeks and the remarkable staff at HMES!" For nearly 40 years, the FETC has gathered the most dynamic and creative education professionals from around the world for an intensive, highly collaborative exploration of new technologies, best practices and pressing issues. Its impact has been felt by thousands of districts, schools, educators — and ultimately students. Each year, FETC is tailored to the needs of an increasingly technology-driven education community. The 39th National Future of Education Technology Conference featured industry experts and unrivaled agenda content, an Expo Hall filled with the latest and greatest solutions, and a community of thousands eager to network with like-minded peers.